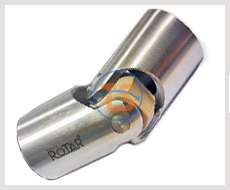 TRADELINK SERVICES - Universal Joint supplier India, U Joint Distributor, Single Joint, Double Joint, SS Joint, Extendable Joints, Needle Bearing Extendable Joint, Polymer Universal Joints, Ball Joints, Cardan Shafts, U Joint, Cardan Joint. Popularly known as universal joints, ball joints or Cardan shafts - these are all metal couplings with a capacity to work upto 45° angles. Located in Castelleone, a small town, off Milan (Italy), Flli Aramini srl meets the demand of the entire world for their requirements of Universal Joints, gathered over a period of around 50 years - with distributors ranging from the USA to Australia to India. These joints are used in various industries like packaging, printing, automation, material handling and machine tools etc. Model AL is for light duty applications and Model A is for powered applications, with a hardened bush of alloy steel and capacity to retain grease for lubrication purposes (which increases the life of these joints). Both AL & A are suitable for speeds of up to 800 rpm. Model V is designed for speeds upto 4000 rpm and fitted with needle bearings. 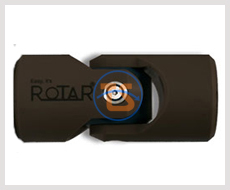 ROTAR® offers extendable type, quick release, and male pin type in all the 3 models. Stainless Steel construction, blackening and electro-nickel coatings are also available - as standard. Bore range is from 6mm to 50mm and can be supplied with key, square/hexagon or threaded bores. Special products to suit individual client’s designs can also be made. Based on revolutionary thermoplastic material, ER HT series was studied to meet the needs of several sectors, overcoming the limits of the alloys. The characteristic of the ER HT series : certified materials, usability under low to high temperatures, autolubrication, dust and maintenence free, speed, all combined with lightness, granting superior performances suitable for several markets. 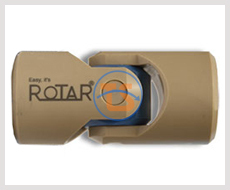 The ER HY Series is the revolutionary brand-new series enriching Rotar's product portfolio. The ER HY Series combines thermoplastic materials ( all patented ) with steel and stainless steel. The ER HY Series was created to enhance the charecteristics of the ER HT Series. In fact, the coupling of thermoplastic materials and alloy steel provides the possibility to reach higher speeds and to transfer higher torques. Case History : Bardi S.p.A.
Bardi was founded in 1950, and became a leading player in the bottle washing industry. Presently Bardi moved into the returnable glass industry. Bardi products portfolio includes 3 lines : glass bottle washing machines, five gallon filling lines, 5-19 pet complete line. Bardi chose Rotar's ER-HT joints & Shafts for their Automated Production Lines. Mr.Spotti, the Technical Director at BARDI S.p.A., states : the stainless steel products are certified for the food industry, but require a specific grease, which has to be certified as well. The ER-HT Joints & Shafts, do not need any lubrication, additionally fit high technology requirements, therefore the ER-HT were the perfect choice. We decided to immediately move from the stainless steel to the thermoplastic joint. The ER-HT is something new in the market: a joint autolubricated, high tech material fully certified for the food, pharmaceutical and cosmetic industry, can be washed with all chemical cleansing agent, resist high temperatures, are dust-free and additionally combined with high mechanical resistance. A disruptive innovation. 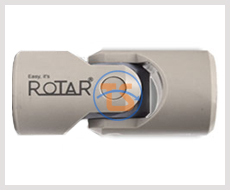 Rotar Universal Joints have proven their capacity to work very efficiently under Indian conditions – based on growth of the popularity of this brand in all industries. 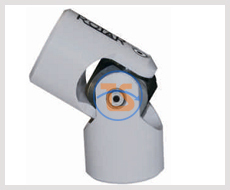 These joints are machined on specially designed mass production machines which offer consistent quality. Universal Joints manufactured locally cannot guarantee the torque ratings, stipulated for the particular size.